Aust-Litters: Here are some suggestions for your first Blog. Chose any one topic – or create your own (and check the unit outline for details on word-length etc… and remember you have to peer review one other class mate each week- be sure to cut and paste a copy of your comment and keep a duplicate of your comment in your own Blog). 1. You have heard and seen a number of reactions to the Australian landscape. If anyone (perhaps from overseas) were to ask you for your honest opinion on what parts of the Australian landscape you had seen and what your reaction is to the Australian landscape, what would you say? You could write this in the form of a letter, a poem, a short prose description… and you could illustrate it if you found an appropriate visual image. 2. Do you think Judith Wright’s thought “I’ve no wish to chisel things into new shapes” has had any impact on contemporary Australia? You could answer this question in the form of a mini-essay, or you might think of a landscape setting that you could describe (in poetry or prose) that could illustrate your point of view on this question. 3. Could you write a short passage describing someone’s response to a landscape, imitating the style of David Malouf’s passage from Fly Away Peter? 4. Write a short description of the landscape where you live now. 5. How important is the way we respond to landscape to our sense of identity? You could write a mini essay on this or again find a way of putting this thought into a brief poem or piece of descriptive prose. 6. Write a very short appreciation of one of the authors listed for this week in extension reading listed in the unit outline and try to persuade your reader to go there and read the same author. And as you know from what it says in your unit outline, if none of these topics work, then you can create a topic of your own….. and remember, part of you job is you must write a peer review comment on the entry of someone else in the group (that could be someone in your tutorial group, but it can also be from someone in another group. Here is me appreciating our amazing landscape last weekend at Jerusalem Bay. 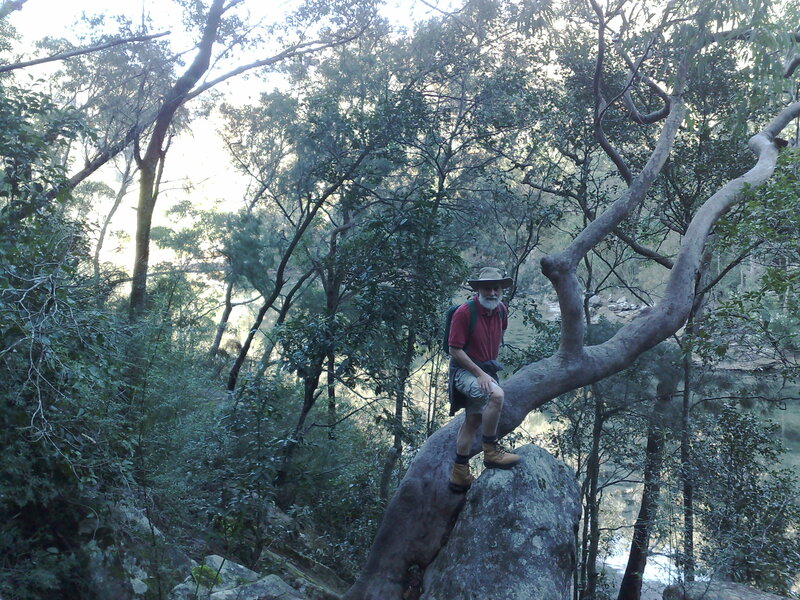 I am standing next to an Angophora, one of those weird Sydney redgums that shapes itself around rocks. All the wildflowers are out now… so try to organize yourself to “go bush” soon!